Small toilets and cloakrooms are not the rooms we often think about renovating; they can be often bland, dull and inexpressive. 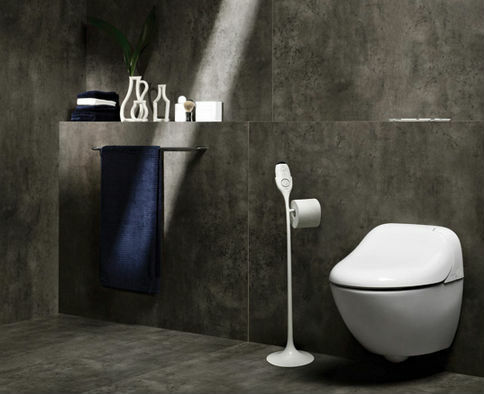 In our latest FindaTrade blog we have brought together ideas to help get the best when you renovate your toilet or cloakroom. These few square metres are a place where we go several times a day. Therefore, they deserve some attention . Even though renovating other rooms is a priority, why not renovate your toilet and let your imagination and creation run wild? Give this little room a real chic, trendy or zen atmosphere! There is a wide choice of wall coverings: paint, tile, wallpaper or even custom designs. If you have a tight budget, painting is usually your safest bet, but this can still be done with your own custom design. Indeed, you can stick newspaper or comic strips on a single wall and paint the other 3 walls with a lighter colour. Children can also take part in the renovation of this small place. Ask them to draw a story on a wall, they will love it! If you choose to paint only, we recommend that you paint the walls with two shades : flashy colours to give vitality; cold colours for a more zen and quiet atmosphere. For those not looking to go to far with your styling there are still many effective options available to you. The walls can be painted white or in pastel colours and then vinyl stickers with quotations or stencils can used to provide some subtle individual styling. Wallpaper provides the ability to tell a story: flowered, it will bring a bucolic touch to your interior. Redd brick effect will give the idea of a New New York loft living space, or even winding curves and entanglement will give a psychedelic touch to your toilets. As for the flooring you can play with shapes, colours and materials. A low cost saving idea is to repaint your tiles or to put lino down. You can easily find unusual patterns in your diy store. Continue to play with the style until you are happy with the look. If you want a spring fresh look you may even be as bold as to use an artificial grass effect flooring. Play your creativity card with accessories. Today, toilet manufacturers have more creative ideas than ever. 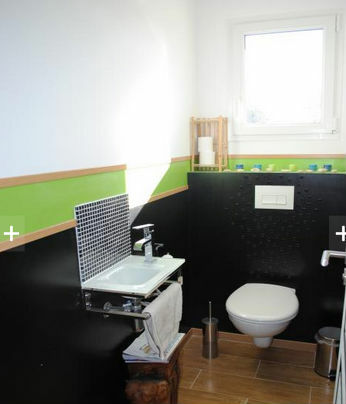 Why not match the lid of the toilet to the brush? If you do not intend to change your white lid for something more colourful or fanciful, opt for stickers that you can paste inside or outside the lid. There is nothing more boring than a roll of toilet paper! So bring a design and creative touch to it: there are now all kinds of colours and patterns. A pyramid of colours or different rolls placed on a window sill, a design paper dispenser will be part of your toilet. Think also about the toilet bowl! For a good ten years now suspended WC have appeared in private properties, until then reserved to public institutions. Although more expensive than traditional toilets, they are space-saving and look good. For further space-saving, get a sink with a cabinet or a small hand wash with a suspended cabinet. Play with round corners; keep uniformity in shapes and colours. Finally, we also suggest small accessories that have less utility in your toilet but that will bring their full dimension to this small space: mirrors, wall lights, design towel racks, a funky toilet brush, a small colourful bin and why not a mini bookshelf mixing old books from different eras as well as other more contemporary ones. Finally, we will conclude this article suggesting to have fun while renovating your toilets, be creative and imaginative but keep a harmonious style be it trendy, zen or even offbeat!